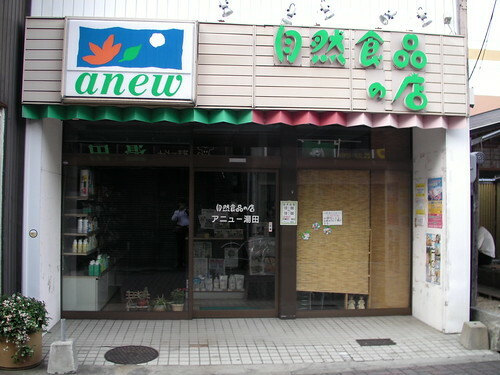 Japanese Moderation: Rare Japanese Health Food Shop, a photo by timtak on Flickr. There are fewer health food shops. The "natural food store" above is a rarity. The Japanese eat less meat but there are very few vegetarians, nature is never far away but there are fewer nature enthusiasts, religious artefacts and rituals are everywhere but there are few Japanese that are really into a religion, Japanese food is generally healthier but there are fewer health food freaks. The same Japanese culture of moderation could be said to pertain in the fields of fitness, dieting, and even economic wealth. Perhaps this originates in Buddhism, which calls itself "The Middle Path." It might also be ascribed to collectivism and the Japanese love of being "normal" (futsuu) which is a compliment (Oohashi & Yamaguchi, 2005). However, at the same time, it would be untrue to say there are no "freaks" or otaku in Japan. Otaku are many and varied. The Japanese practice moderation in all things, including moderation.